Another useful brick for FPV is plane stabilizer and autopilot. In HobbyKing there is a new multicopter controller with all needed sensors: gyroscopes (3D), accelerometers (3D), magnetometer (3D) and barometer (pressure/altitude sensor). This is mainly designed as multicopter controller but MultiWii is very advanced software and has also support for planes (traditional and flying wings). With such range os sensors this controller is able to act almost as autopilot, as it features navigation based on magnetic heading from compass. With gps attached it should be able to do RTH (return to home). Next step will be to install Arduino environment and compile firmware with plane support. 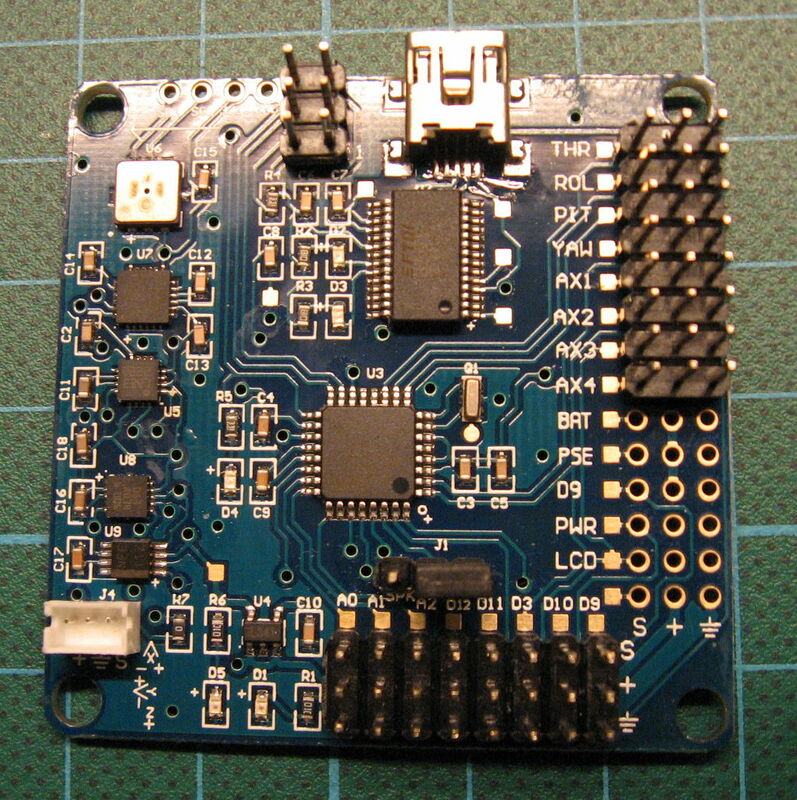 (**) – this pin is also connected to jumper J1 which connects DSM2 port OR USB interface. Header J5 haven’t header soldered. Led D1 indicates that main 5V voltage is applied to the board. Led D5 is connected after 3.3V voltage regulator. Leds D2 and D3 are connected to FTDI chip and indicate USB uart activity. And one warning: this processor have only one serial port, DSM2 input uses it, so it’s not possible to connect receiver to this port and at the same time use usb interface for configuration! I downloaded newest version of MultiWii from svn (revision 1244). To properly compile I had to get source from MultiWii_shared and rename directory to MultiWii. Once opened sketch MultiWii.ino, there should be multiple tabs with included files. In this version there is enough to modify config.h: uncomment #define HK_MultiWii_328P and copter specific options (for me there were TRI, MINTHROTTLE and SERIAL_SUM_PPM for CPPM output from FrSky receiver). I flashed it with this firmware without any problems using only usb cable and above configuration (this board already has flashed Arduino bootloader). I ordered another one and it looks like a little different version. At least it has all labels near pins, so I updated table above. Additionaly it has soldered pin header on ISP (programming) pins. I am having a problem with my multiwii board. I have connected it to my spektrum radio, downloaded firmware and have everything working correctly on GUI. Throttle moves, GPS finds me on map, mag and horizon move correctly, but I cannot arm motors. I have calibrated all separately from receiver, all run. Have tried various minthrottle commands on config.h. Any suggestions to get it to arm? Did you arm controller (throttle down, yaw right)? Yes no results, no beeps. I only get a beep when I first power up. Ok, so it looks like you have problems with arming control board, not motors. I had the same issue at start;-). Problem is in transmitter – all sticks/channels should be calibrated to output full range of signal (1000-2000). In MultiWiiConf you could check how wide the signal range really is (it shows values near bars). To arm or perform other magic sticks combination, output must be below 1100 or above 1900, otherwise nothing will happen. Another way of arming is to configure some trasmitter switch connected to AUX input to make ARM in some position. witam. mam ten sam problem. po podalczeniu zasilania sa 4 sygnaly dzwiekowe i nie moge uruchomic obrotow. w jaki sposob zmienic ustawienia uruchomianioa silnikow. wystarczy zmienic paramatry w config.h? Najlepiej jednak zwiększyć zakres na aparaturze. Jak tego się nie da, to osobiście polecam skonfigurowanie sobie po prostu uzbrajanie i tryby lotu na przełączniku na jakimś wolnym kanale (sam tak mam – jakoś ustawienie drążków w dziwnych pozycjach mi nie pasuje). Ostatecznie można poszukać w kodzie MAXHECK i MINCHECK, ale nie wiem jak to teraz działa, bo do kodu dawno nie zaglądałem (od wersji 2.2). Wgrany jest soft do quada, jeżeli chcesz cokolwiek innego (tricopter czy hexakopter), to musisz sam skompilować Multiwii z odpowiednią konfiguracją. I tak polecam tak zrobić, bo do końca nie wiadomo jaka wersja jest tam wgrana. Po ściągnięciu i instalcji Arduino jest to dosyć proste. Co do ustawiania, to jeżeli już zainstalujesz Arduino, to jest tam jakiś ‘przykład’, którym można wyczyścić eeprom, wtedy nowy soft wystartuje z domyślnymi ustawieniami, które podobno wystarczają na początek. dziękuję bardzo 🙂 pozdrawiam sedrdecznie. I am using this board for my QuadX configuration. all the sensors are working fine and the RC inputs are coming well but there is no output from the board itself. The motors are not running. I tried calibrating the ESC’s which worked fine but once I load the original Program only the motors doesn’t work. Please help me out as soon as possible. Am I missing out anything in conf. Can you arm board? See my response to Herman for other hints. I’m not familiar with this board, but maybe you can help. My question is: can the SPI interface of the microcontroller be used somehow? Of course it needs also programming. But basically this is bare Arduino board with sensors connected through level converter, most pins connected to headers (sometimes multiple times) and with two unconnected CPU pins (error in pcb design?). I use Frsky and CPPM, so I get all channels via one cable (THR), so I didn’t need to connect all cables from receiver. You can use any pin labeled with ‘+’ and ground sign, or usb connector. It should be powered only from 5V as it doesn’t have voltage regulator and reverse voltage protection as typical Arduino board, so be careful and do not apply higher voltage. I have a multiwii 328p board. I can only get it to arm when it is connected my usb. I don’t have to start the gui at all (however everything looks fine when I do). I have calibrated the esc’s and it will start up noramlly and run fine ONLY when connected to the usb. If I just plug it into my battery a few moments go by and my motors begin to beep ever few seconds. Any ideas?